Angela Rico, ‘Marquesan Islander’, based on a photograph by Jimmy Nelson. Hi Angela, we are thrilled to have you! To start things off, please introduce yourself to our readers! Hi everybody, my name is Angela Rico and I am a 3D character artist from Bogotá, Colombia, currently residing and working in Los Angeles. There were two things which put a sudden stop to my plans of becoming a veterinarian and made me pursuit a career as a 3D artist: one, watching ‘Final Fantasy VII: Advent Children’, and two, playing the first ‘God of War’. I’ve loved art as long as I can remember, but for me, owning video games or going to the movies wasn't a common thing growing up. I didn't even know being a 3D artist was a possibility until I was 19 years old! As I fell in love with the God of War games and 3D cinematics, I wanted to be part of the team who made such awesome games and movies. Before relocating to the US to pursue my dream of working in the industry, I studied multimedia arts in Colombia. I enjoyed it so much that I decided to look into 3D schools in the States. I first went to the Art Institute of Phoenix, where I got my Bachelor’s in Media Arts and Animation, and later attended Gnomon School of Visual Effects, Games and Animation, complementing my studies there with additional online training. ‘Marquesan Islander’, medium shot. Angela tells us it took a lot of work to faithfully recreate the crossed arms pose of the islander. I’d like to dive a bit deeper into your work history. After graduating from the now defunct Art Institute of Phoenix, you immediately started working as a 3D Artist. That’s right, I got a job as a 3D artist at MOS Defense in Arizona. I was responsible for modeling and texturing assets and environments for military simulations, as well as modeling asset designs that required precise measurements. It was a cool job that ended after eight months. Before you decided to continue your training state side, you spent some time teaching English in Kyoto, Japan. At the time, I didn’t feel I had enough experience to break into the entertainment industry in Los Angeles, which is where I wanted to work. So, I went to Japan instead. It had always been a dream of mine to live there. I was there for almost two years, teaching English to a wide range of wonderful students. It was never my goal to be a language teacher, but it was so much fun and living in Japan was incredible. Still, I missed creating, so to maintain both my skills and my creativity, I worked on personal art projects in my spare time. I’ve occupied myself with 3D artwork, naturally, but also traditional sculpting in clay. Part of her entrance portfolio for Gnomon, this ‘Kimono Girl’ is reflective of Angela’s love for Japan. Upon your return to America, you enrolled at Gnomon School of Visual Effects, Games and Animation, where you managed to win an impressive seven Best of Term awards. What’s great about Gnomon is that everybody there works hard all the time, the students are so motivated. I found the intense workload fun, honestly. I like having homework and being pushed by a deadline. The instructors at Gnomon are all amazing working professionals. Having the opportunity of impressing someone who was working on ‘God of War’ just prior to teaching your class, is an incredible incentive. Gnomon provided us with so many fantastic courses; I loved the foundational orientation of the curriculum: learning core skills as well as new techniques, and courses like Character Modeling, Life Drawing, and the traditional sculpting classes shaped me as an artist. Can you tell us more about your current employer, Blur Studio, and your work there? It’s been my dream to work at Blur ever since my student days at the Art Institute. Their reels were a huge inspiration to me and I would watch them over and over. During my first week at Gnomon, Blur held an event there, which definitely fueled my drive. To actually get hired after graduating was incredibly exciting. As a character artist, I’m currently responsible for modeling and texturing on character props as well as updating character color spaces which fit into their current pipeline. I’m building towards working on full characters. What has your experience been like working in the still male-dominated CG industry? I feel deeply fortunate to have had an amazing internship as a student and a fantastic first job upon graduating. While working on my demo reel, I was an intern at Aaron Sims Creative and was subsequently hired by Blur Studio. In both places, I have met great people and I haven’t had any negative experiences at all. While I am privileged to work with so many amazing artists at Blur, I’ve been especially inspired by two amazing women there, Gnomon grad and instructor Krystal Sae Eua and Amy Sharpe, fellow character artist and my mentor at work. Speaking of inspiration: what inspires you as a 3D artist? As an artist in general, I’m inspired by many different kinds of games and films, but as a character artist I draw inspiration specifically by whatever piece I’m currently working on. Above all, I love searching for meaning, personality, and storytelling within the piece, especially if I have to create it myself. How do you approach character design in terms of visual storytelling? When I build a character, I do extensive research not only on story, but on everything that seems relevant to me, from the concept artist and the culture behind the piece to anatomy and costumes. I feel very strongly that a firm understanding of all of those details is critical to the process. Angela’s approach to character design involves meticulous research into every aspect of her subject and leads to astonishing results. Now let us talk about your work in more detail, namely your 3D rendition of a portrait photo of a Polynesian islander by Jimmy Nelson. Please tell us all about the project and the story behind it! For one of the central pieces of my demo reel, I wanted to do a piece that was highly realistic. I was looking for an opportunity to really push my skills. 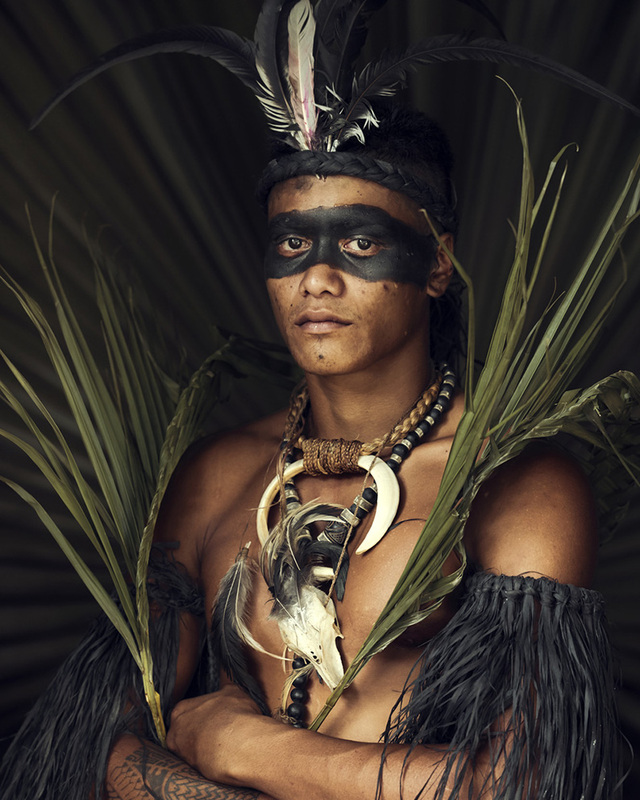 Eventually, I found inspiration in Jimmy Nelson’s extraordinary book ‘Before They Pass Away’. I chose this particular photo because of the feathered headdress and the detailed costume. I was thrilled to research how to execute some of those details, like the ropes and braids. The project took a solid four months to complete; I continuously worked on it during my internship and while finishing my program at Gnomon. Is there a difference in working off of a photo compared to other reference material? The only difference I see, is how clear you can see items in a photo vs. another artist’s representation of it. Regardless of the primary source, you still have to research and find references for everything you are working on. Angela could probably tell you which bird the feathers from the islander’s headdress belong to! How did you approach recreating the portrait in a 3D environment? Can you walk us through the development process step by step? I started by researching the Marquesas Islands in French Polynesia. I found out as much as I could about local plants and birds that the islanders find and use everyday, as well as tribal customs. When I had a clear understanding of what each element in the original photo was made out of, and how it was made, I blocked out the character, keeping proportion in mind. Then, I sculpted the anatomy and the objects around his neck. Once I had a solid base that was retopologized and UVed, I started texturing. Although I tweaked the sculpt until the very end, having textures early on allowed me to see how it would look with color, making some fixes easier. The next step was to R&D ways to do the feathers, braids, ropes, and the strings on his arms. I found the best way was to utilize XGen. With the help of my friend Malcolm Moseley, I also found cool ways to work procedurally on the leaves in Houdini. From there, I moved to his facial and body hair. The last step for the character was posing. I used an autorigger to get a basic rig that helped me lock down the main pose. It took a long time to get a natural look for the crossed arms. Since I didn’t spend a lot of time rigging and painting weights for the character, I still had to fix the posed sculpt back in ZBrush. When I was happy with the way the character looked, I began lighting and looking for the right camera view. Finally, I took my render passes to Nuke and comped it to the final image. I also color corrected a bit in Photoshop. What software did you use to create this piece? Any plug-ins you found particularly helpful? In addition to the software mentioned above, I also used Mudbox, Maya, Mari, Substance Painter, and V-Ray. In terms of plug-ins, I found The Setup Machine very useful to get the rough pose. Based on an illustration by Peter Polach, Angela’s eerie 3D reimagining of the ‘Bride’ is another prime example of her abilities as a character artist. Have you used RebusFarm before? If yes, please tell us more about your overall experience. Is there anything you especially like about our service? I have not used RebusFarm before, but I look forward to using it in the near future as I am collaborating with other artists on larger-scale projects. I am honored and grateful to be featured as your 3D Artist of the Month. I also want to mention that I was able to complete this piece thanks to the amazing mentorship and guidance of Pete Zoppi (character artist at Treyarch and CGMA instructor), Miguel Ortega (director and Gnomon instructor) and Eric Valdes (character artist at Santa Monica Studio and Gnomon instructor). I am currently working on some exciting projects at Blur Studio as well as a collaboration with several amazing Gnomon graduates that I can’t wait to share soon! Sounds like we have a lot to look forward to! Angela, thank you very much for taking the time and all the best in the future! You want to be our next featured 3D Artist of the Month and win 250 RenderPoints? Just visit our 3D Artist of the Month competition page and submit your entry. We'll choose the best image and contact the winner.